If you are looking for a positive way to start the year after an indulgent christmas to freshen up your smile for 2019 tooth whitening might be the answer you are looking for. Many of the treats that we enjoy around Christmas such as mulled wine, cranberry sauce or even the coffee giving you the energy to get through it all are big sources of staining for your teeth. Over time these kinds of staining can begin to accumulate, resulting in a dull or discoloured smile. Careful day to day cleaning and regularly seeing a hygienist can remove most of the surface staining on your teeth but the more deeply ingrained discolouration cannot be addressed by cleaning along. Tooth whitening actively removes staining in the deeper tissues of your teeth to leave a whiter and brighter smile without damaging your teeth and without any painful or unpleasant dental procedures. If you are looking for a fully qualified dentist in Reading to provide tooth whitening to get your teeth back to the smile you deserve feel free to contact us. Our cosmetic brand Natural White provide free consultations where we can assess your teeth and discuss what options you have to achieve the results you are looking for - so you can smile with confidence! In most cases the only treatment needed to improve the appearance of your teeth and restore their underlying colour is whitening which involves an initial consultation and taking moulds of your teeth. Approximately 2 weeks after this you will be given a set of custom fitted whitening trays which you then wear with a whitening gel at night at home for the following weeks. This process does not cause any pain and does no harm to your teeth but gradually whitens your teeth giving you a smile you can be proud of. Happy 2019 to all our patients from Prospect Street Dental Practice. We all know January’s a fantastic time for New Year’s Resolutions - so want to help suggest some changes you can make to help protect and care for your teeth better than you did in 2018! A high sugar diet is the biggest factor in causing tooth decay, so cutting back on the amount of sugar in your diet is the best change you can make to minimise the risk of suffering from dental pain and needing treatment. This could be as simple as making a change from sugar to sweeteners in your hot drinks, making a swap from soft drinks to water or even just ditching the sweets for healthy alternatives. Important as it is to see a hygienist regularly to maintain your teeth the most important element to good oral hygiene is a rigorous daily routine and there is always room for improvement. Set yourself a simple and achievable daily goal such as trying to get into the habit of cleaning between your teeth with floss or interdental brushes every weekday for the whole of January and see if you cant carry the habit forward from there. Careful cleaning is vital to maintaining healthy teeth and gums and a few minutes extra attention each day can go along way to avoiding gum disease and maintaining a healthy smile. 3. When Should I Have Regular Dental Check Ups? If you’ve fallen out of the habit of attending your routine examinations or are slightly overdue on having a scale and polish today’s the best time time to get back into the swing of things and check that your indulgences haven't done any lasting damage. It is always best to catch any issues in the mouth early before they cause pain or develop into major issues. Smoking is huge contributing factor to both oral cancer and gum disease so if you’re thinking about finally kicking the habit make the change now and your teeth will thank you for it. It is never too late to stop even if you do suffer from gum disease - with the removal of cigarettes from the equation the likelihood of gum disease resolving improves dramatically. What does this mean? Even if you have suffered harm from smoking it’s always worth giving up! 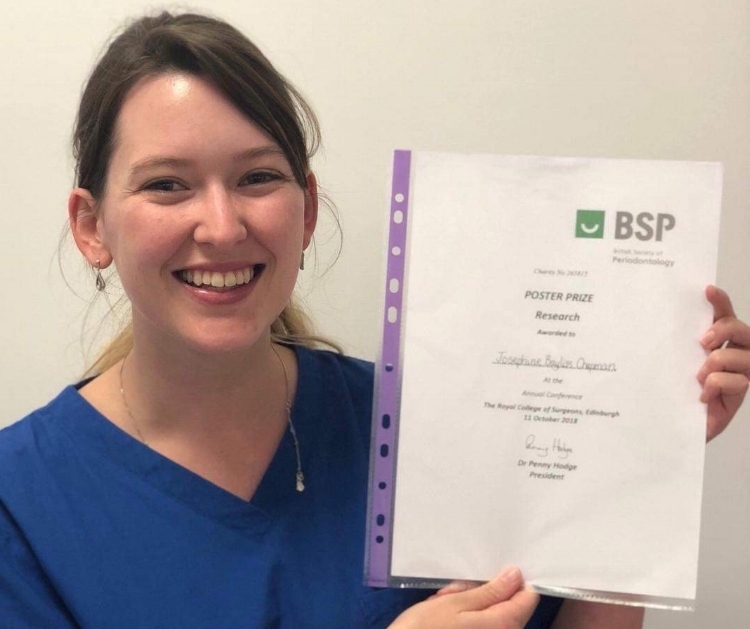 Prospect Street Dental is proud to announce that our associate dentist, Josephine Bayliss-Chapman has won the research poster prize competition at the British Society of Periodontology (BSP) conference in Edinburgh this month. To get her hands on this annual prize Josephine researched “How heritable are periodontal diseases?”, or how likely are you to inherit gum disease. Josephine’s study concluded that about a third of the risk of developing both gingivitis and periodontitis is due to genetics. This risk only increases when twins are considered into the study. The BSP is a well established dental society involved in research, education and debate, working hard to raise awareness of periodontology, or gum disease, with the public, patients, dental and medical professionals. Josephine is currently studying her Doctorate in Periodontology at Queen Mary, University of London and is in her second year of training. She also works at Prospect Street looking after patients and making sure gums are healthy. Gum disease begins with inflammation of the gums and can be hard to spot. One of the first signs you may spot is bleeding from the gums when you brush your teeth. If this is then left untreated there may be increased bleeding from your gums, which may even be started simply by eating, bad breath, changes in teeth positioning, lengthening of the teeth or gum recession, and there could even be pain. If you’re unsure your dentist will be able to help. How To Protect Against Gum Disease? Luckily protecting against gum disease is relatively simple you just need to brush your teeth twice daily and floss once, either using dental floss or an interdental brush. Both of which can be purchased on your next dentist visit or in all good chemists. Regular visits to both your dentist and hygienist will also help protect against the build up of plaque and therefore keep your teeth and gums healthier. Treating gum disease depends on the stage the disease has got to. Usually with a professional clean and establishing good oral hygiene practices it can be completely halted. Sometimes however more is needed to stop the disease and save your teeth. Diabetes is on the rise, it's estimated that there are 415 million adults aged 20-79 with diabetes worldwide, including 193 million who are undiagnosed. A further 318 million adults are estimated to have impaired glucose intolerance which puts them at high risk of developing the disease. High levels of sugar in your blood and the inability to control the level of sugar can lead to severe gum disease if not effectively treated. Severe gum disease was associated with significantly higher levels of HbA1C (a blood test that measures your glucose control) in people and there appears to be a direct relationship between diabetes and gum disease. If you think you could have diabetes, make an appointment to get your gums checked. People with diabetes have a higher chance of getting gum disease, which can lead to tooth loss and may make your diabetes harder to control. The earlier you seek help, the better the outcome will be. I Don't Have Any Of These Signs, Can I Still Get Gum Disease? Gum disease may also be present and get worse with no apparent signs. Especially if you smoke, so even if you don't think you have gum disease now, you should have regular check-ups as part of managing your diabetes. Your dentist should be able to pick up early signs of gum disease. You should clean your teeth and gums twice daily at home for a minimum of 2 minutes. Also cleaning in-between the teeth daily is important and your dentist or hygienist will be able to show you how to do this. 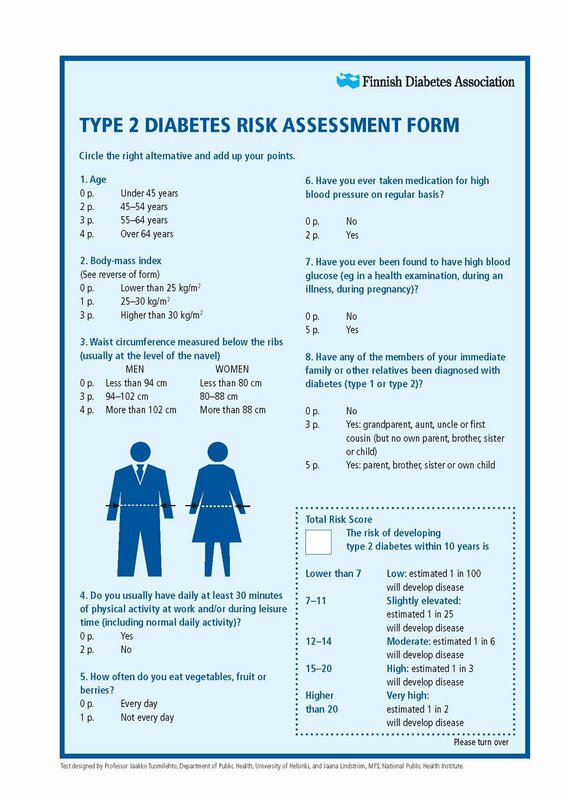 Take the below questionnaire to see if you could be at risk of diabetes and therefore gum disease.